This is the same folded quarter-wave bandpass filter which has been described in the ARRL handbook for years, so I won't bother going into detail on how to construct it. Photo above shows what the finished filter looks like. Although I don't have any problems with harmonics or TVI, I live less than a mile from an RF site which includes 2 commercial FM broadcast stations as well as numerous paging, cell phone, and public service transmitters. 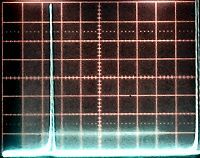 Thus, my reason for building the filter was primarily to clean up the receiver and eliminate de-sense. I built the filter according to the dimensions given in the 1980 ARRL HANDBOOK. I used 1/8th inch thick solid copper flat stock for the quarter-wave strip, and machined the insulating spacers from 1/2 inch nylon round stock. The variable capacitor was stripped from an old tube transmitter carcass (grid-dip cap), and was modified to make tuning easier by removing 1 plate at a time until proper tuning was obtained with the plates in the 50% meshed position. This section is posted here not as a how-to description, but as a performance review of the finished project. 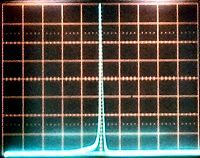 The completed unit was tested using an HP 8654A signal generator, an HP 432B RF power meter, a Wavetek 2001B sweep generator, and a Philips PM3256 oscilloscope. The 'scope photos below show the swept frequency response. 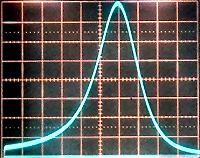 Total vertical dynamic range is 20 dB, and the filter is tuned to 50.250Mhz. 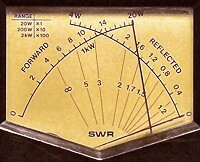 Insertion loss measured .5 dB, and SWR was 1:1.